There’s no such thing as too many cheap, open late restaurants near college campuses. We all know why without me having to say it, right? 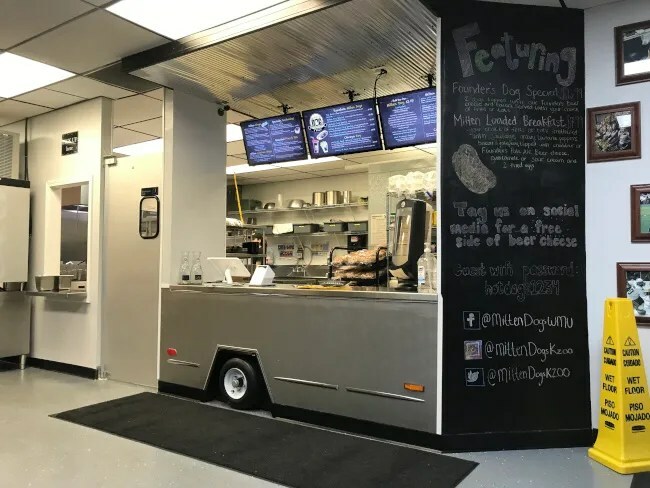 A few weeks ago, the students at Western Michigan University got another option to fill those late night cravings……hot dogs. 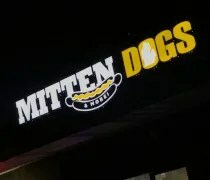 Mitten Dogs and More is right on the corner of Howard and Michigan across the street from WMU’s campus. The small restaurant is in the strip mall on the south side of the road right next to Jimmy John’s. This storefront used to be All Thai and before that, a BoRics Hair Care. It shouldn’t be a surprise that the house specialty is hot dogs. 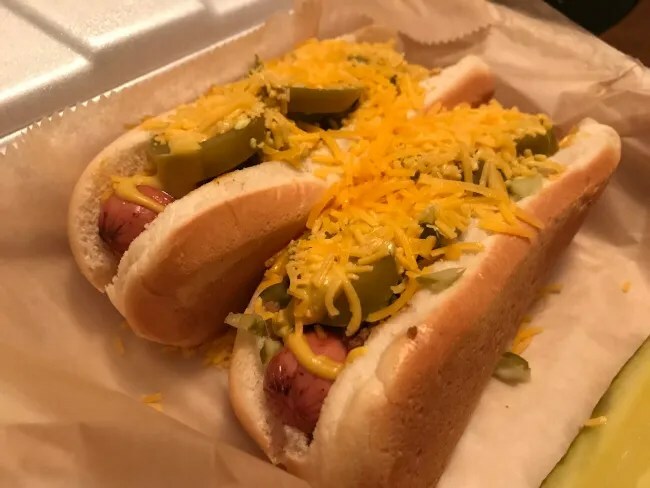 Sure, they have the traditional Michigan coney, but there are a number of variations on that and even a Chicago Dog option. The “and more” is mostly chicken in the form of strips, wraps, and sandwiches. There’s a large order counter in the middle of the restaurant that is designed to look like a hot dog cart. A large chalkboard on one side lists the day’s specials and TV monitors hanging from the ceiling have the menu. I hadn’t seen a menu before I stopped in so it took me a few minutes to decide on what I wanted. I put in an order for The Mitten Drunchy. That’s two dogs topped with choice of chili (a looser coney sauce or meatier chili), cheese, onions, jalapenos, pickle, and mustard. It also comes with choice of fries or tots also topped with chili cheese. The cost was just over $9 since I declined a drink. I took a seat at one of the tables in the small dining room with about half a dozen total. There’s a pick up window on the other side of the kitchen door with someone from the kitchen yelling out names when orders are ready. 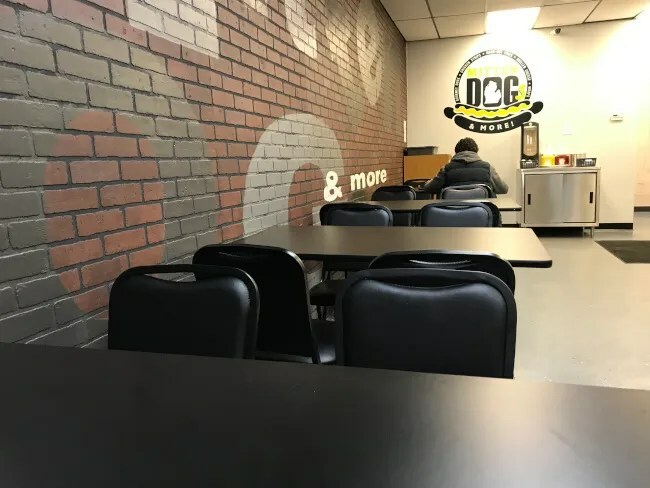 The dining room is fairly simple with a faux brick wall and the company logo on one side and simple white walls the rest of the way around. There are a few autographed sports pictures near the entrance but other than that, it’s a simple space. The reason I even stopped for dinner is because I got off work late. J took the kids to movie night at L’s school and by the time I got back to Kalamazoo, I could have made it for the last few minutes of the movie so I just skipped it and got dinner before heading home. I took the food home with me unsure of when they would actually get there. I beat them by about ten minutes so I got to eat my meal in relative peace…I mean, we have cats…and they couldn’t keep their nose out of it no matter how many times I threw them off the table. I started with the fries first. They are pretty interesting. They are shaped like steak fries but they’re really thin. The fries are covered with a cheese sauce and choice of chili. I wet for the meatier, thicker chili on the fries. The fries don’t hold up to the topping at all. The fries are so thin they can’t really stay firm once covered in cheese. They taste was really good though. The chili isn’t really spicy but has a pretty strong, meaty flavor. The cheese is similar to a nacho cheese sauce and there was a lot of it. The fries were golden brown and crispy around the edges so they were fried well. There’s just a lot on top. I’ve documented on this blog many times that I don’t really like hot dogs yet I keep really enjoying Coney Dogs. As with anything, a lot of it has to do with bad experiences with bland food from my childhood. I’ve come to appreciate the Coney Dog and look forward to finding places that specialize in it. The Mitten Drunchy dogs didn’t even really taste like hot dogs. There was a thick layer of chili on top and there were several jalapenos on each of them. The simple white buns are buns are so soft I didn’t even feel like I was biting through them yet they held the toppings on the hot dog together pretty well. 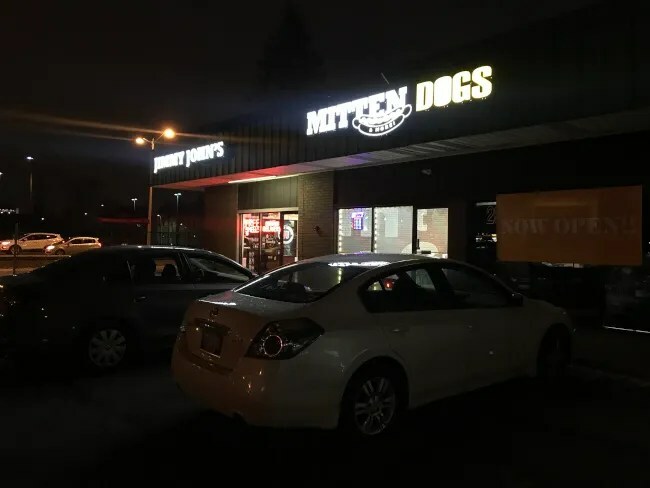 Mitten Dogs and More is a good fit in this part of town. I keep seeing on Facebook they’re staying open later and later with this past weekend being the first time they’ve stayed open until 4:00. 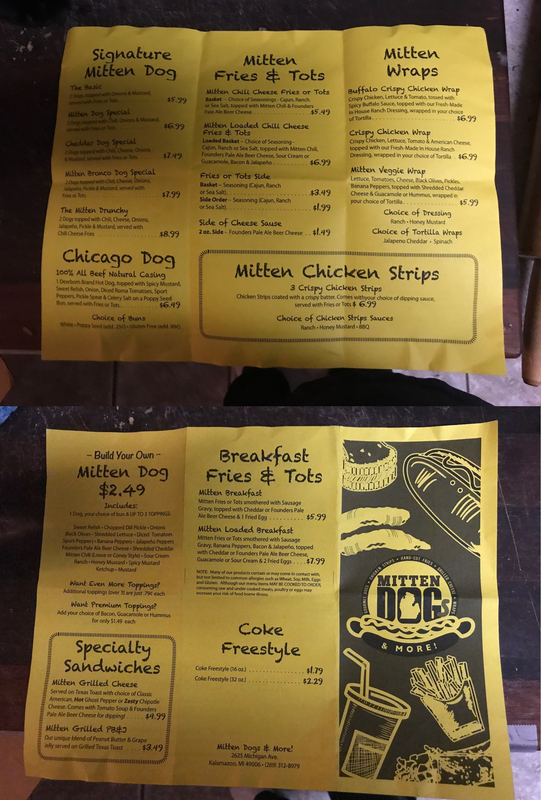 Mitten Dogs and More fits perfectly into the college lifestyle. 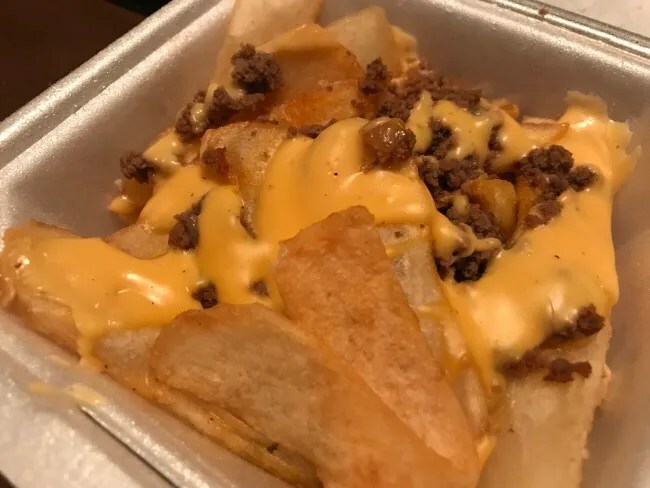 It’s quick, cheap food that is available late at night but it’s also good enough that you’ll want to go back during those hours when normal people eat dinner.